This is a simple running stitch design utilizing a simple four fold radial symmetry. This design ( pictured left ) was stitched out on black satin using a Husqvarna designer 1 embroidery machine with a standard 15 by 24 centimeter frame by john Coldwell using SophieSew version two embroidery software. This two color design comes in three sizes. 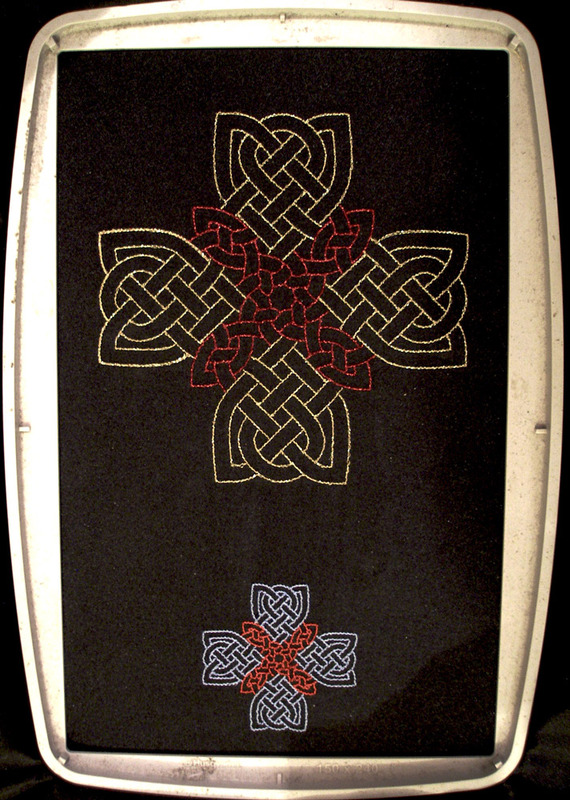 15, 10 and 6 cm.The larger cross pictured is in gold and red metallic thread ( Madeira ). I used a running point pitch of 1.5 mm with a schmetz top stitch needle. I also used red and light brown under-stitch. The smaller design is in red and light blue madeira rayon thread. Same dot pitch of 1.5 mm using a universal schmetz 75/11 needle.Black satin material. Light stabilizer and touch of 505 fabric adhesive. Hi, I am so very happy with this software, I still have to start working with it, but the thought that I can produce my own patterns from foto’s makes my eager to get on with it. I use VIP and your comment section cover that specific format up so that I can not click on it to download. I will use one of the other formats and covert. I like celtic designs and all of these are very nice. Thank you. Good Point… I will look into it….. Job Done ! Can anyone tell me if i could convert it in some way to an ART format, as my machine is a Bernina, and i dont see any option for this anywhere. HELP! One way to convert designs from or to ART formats is to download the free (and very nice) Artlink software from the Bernina website. Look at this page for it’s features http://www.bernina.com/en-US/Products-us/BERNINA-products-us/BERNINA-Software-us/BERNINA-embroidery-software-us/ArtLink-6-Embroidery-Software-us and when you want to download it, look for the download button on the right side of the screen. There is a very nice instruction manual that comes with the software that will help you convert formats. Love it! Can’t wait for the new program to be released. This is really pretty I have a Brother SE400 Embroidrey Sewing machine this will work on it won’t it the PES file is what it calls for .. I am new at this but do i need to download to computer and then connect to machine … Do I need anything to download this file with ….should pop up please I’m sorry to be so not smart yet but i need to learn how to use the Sophie Sew to do my own too. is there a tutorial video to learn Digitizing that is free….